I have little enough to say, and even less worth reading. I've read or heard so many pithy, one-sentence George Carlin lines---not what I would call jokes, because they always seemed too substantive to be classified that simply---that I thought now that I'm older I'd have a good chance at really appreciating his humor. And it's very possible that I would still enjoy his stand-up. But I did not enjoy this book. It started off a little hit or miss, so I thought it just needed to build up its momentum, but by the third disc (of six) it was just dull, repetitive, and neither funny nor interesting, without even a redeeming hint of substance. None of the recurring themes/subjects reached a satisfying conclusion, and some of the material felt so tired that I was continually surprised when he referred to something relatively contemporary.This may have been more palatable as a bedtime read consumed in small portions over a long time, instead of listened to in several-hour chunks on a long road trip. 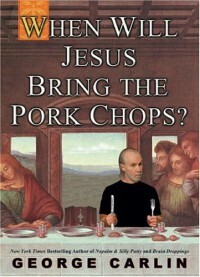 I haven't given up on liking Carlin's work, but I may not bother with the (audio)books in the future.